Rear axle is the last member of power train. In most of automobiles, real axle is the driving axle. It lies between the driving wheels and the differential gear and transmit power from the differential to the driving wheels. It consists of two half shaft connected to the differential gear, one for one wheel. The inner end of the each half shaft connected to the sun gear of the differential and the outer end to the wheel. The rear axle and differential gear are completely encloses in a housing which protecting them from water, dust and injury. The rear axle mainly performs following two functions. 1. It carries the weight of the vehicle. 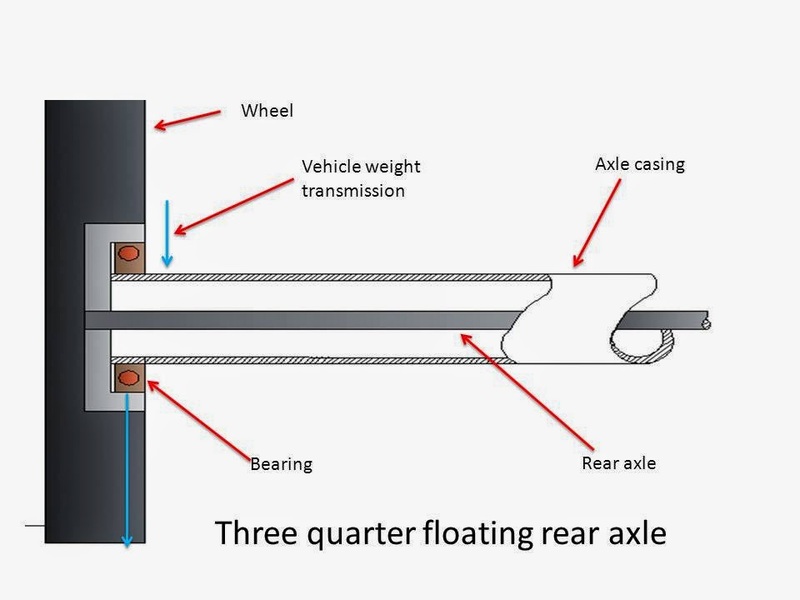 Rear axle classified by two methods. This type of axle is a single shaft and final drive assembly is carried in a separate casing which is bolted to the axle housing. The banjo construction is often used for smaller and lighter vehicle. In this type of axle split shaft are used with the central housing contain the differential gear and it is fitted with a tube on each side to carry the half axles and bearing. In this axle the bearing which support the axle, are inside the casing. 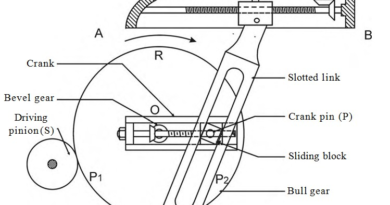 The axle of the wheel is at the center of the axle casing. The whole weight of the vehicle is first transmitted to the suspension spring then to the axle casing, rear axle, wheel and ground. In this axle bearing are on the outer side of casing between the wheel and the axle casing. The wheels are fitted at the end of the axle by means of a key, bolt or nut. The weight of the vehicle is supported partly by the axle casing and partly by the axle. 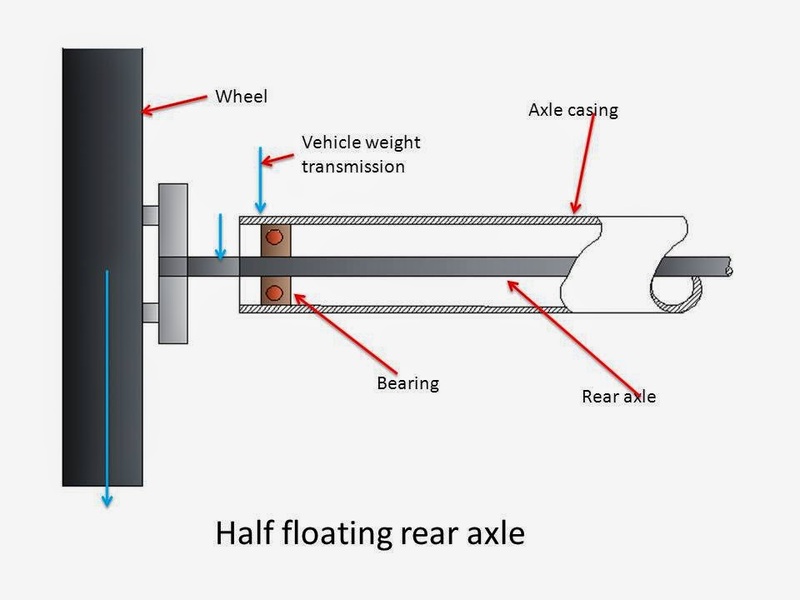 The main advantage of this type of axle over the half floating axle is that the major part of the load is taken by the axle casing and not by axle. Axle only takes care of the rotating and transmits the power. In this type of axle bearing are on the outer side of casing between the wheel and the axle casing. 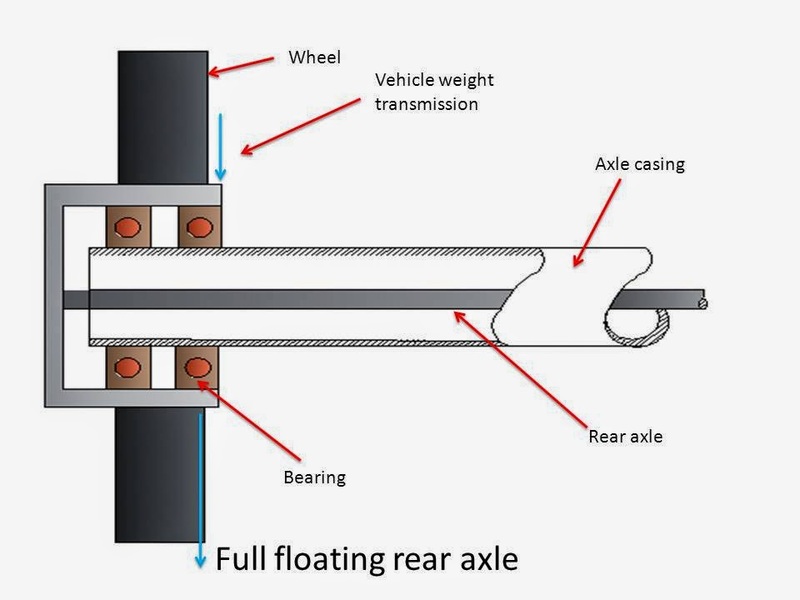 The axle is not supported by the bearing at entire end and its position is maintained by the way that it is supported at both ends. The wheels are fitted at the end of the axle by means of a key, bolt or nut. Thus the entire weight of the vehicle is supported by the wheel and axle casing. The axle is relieved of all strain caused by the weight of the vehicle on end thrust. It transmits only driving torque. Today we have discussed about rear axle. If you have any query regarding this article ask by commenting. If you like this article, don’t forget to share it on social network with your friends. Subscribe our website for more informative articles. Thanks for reading it. Diagrams are very helpful and uncomplicated. Thanks!